Three Game Maker crack related stories in one here. 1. A recent article by the former Game Maker Station PR agency claimed that in the period from 2007 up until a few days ago cracked versions of Game Maker cost YoYo Games $47,390 (US) in lost revenues. 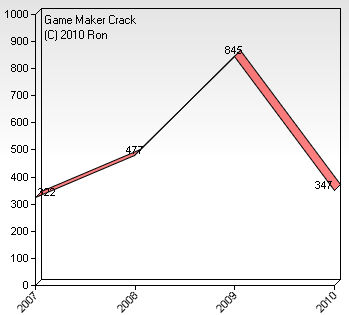 They produced a graph showing that since 2007 just 1,891 cracked copies of Game Maker (presumably mostly Game Maker 7) were downloaded. In the comments that followed the post the author wrote “Sandy says he can’t give out information on the amount of registrations per year. So how do we know he’s being truthful about not making a profit off of game maker?”. Firstly I believe it will be obvious to the majority of readers that those figures are a blatant massive underestimation of the number of illegal copies of Game Maker Pro. Secondly this number is based on the bizarre assumption that everyone who downloaded a cracked version would otherwise have paid to upgrade. I would like to know how they arrived at $25.06 in lost revenue for every download – given that for most of this period Game Maker was sold for $20 (a figure above $25 would otherwise be more reasonable given the higher USD values of the Eurozone and British pricing). It is pretty obvious that YoYo Games wouldn’t want to throw out commercially sensitive information for the whole world to see and we know Sandy isn’t lying about YoYo’s profitability because we have seen their abbreviated accounts. 2. Earlier today I reported that a member on the YoYoGames forums had been posting information in various topics about how to obtain a Game Maker 8 crack. It appears that the “alert” button that members use to inform moderators about unsuitable posts has not been functioning properly since before Christmas. A 5,000+ post member banned pretty quickly once my message got through via PM. But come on YYG – give these volunteers the tools they need to do their job. 3. Sandy has been spending an enjoyable evening contacting the hosts of various Game Maker cracks to get them removed. “Complain to YouTube about copyright infringement? Nelson Mandela got better treatment on Robben Island!” was just one of his tweets on this process tonight. Sending DMCA takedown notices wouldn’t take long if it was done regularly. Problem is there are a lot to catch up on for Game Maker. The best ever crack is this made from SVPTEAM – clean crack, includes the library builder and the extension maker. Well, theres always the “brick trick”. Many console game makers use this now (mostly nintendo) basically, its a fake pirated bit o software that immitation pirates will post on their immatation blogs or a nonimmitation filefront/rapidshare/whatever. Upon installing this supposed crack, it instead ruins the unregistered version of GM (just to annoy, can be undone with a reinstall). If done well enough, bricks can fill up a google result page, making it impossible to tell between the bricks and the real thing. Crack Ð²ÑÐµÐ³Ð´Ð° Ð±ÑƒÐ´ÐµÑ‚ Ð´Ð¾ÑÑ‚ÑƒÐ¿ÐµÐ½ Ð² Ð¸Ð½Ñ‚ÐµÑ€Ð½ÐµÑ‚Ðµ. Ð§Ñ‚Ð¾Ð±Ñ‹ ÑÑ‚Ð¾Ð³Ð¾ Ð½Ðµ Ð±Ñ‹Ð»Ð¾, Ð¿Ð¾Ñ‚Ñ€ÐµÐ±ÑƒÐµÑ‚ÑÑ Ð±Ð¾Ð»ÑŒÑˆÐ¾Ðµ ÐºÐ¾Ð»Ð¸Ñ‡ÐµÑÑ‚Ð²Ð¾ Ð»ÑŽÐ´ÐµÐ¹, Ð´Ð»Ñ Ð¾Ñ‚ÑÐ»ÐµÐ¶Ð¸Ð²Ð°Ð½Ð¸Ñ Ð½Ð°Ñ€ÑƒÑˆÐ¸Ñ‚ÐµÐ»ÐµÐ¹. ÐœÐ½Ð¾Ð³Ð¸Ðµ Ð»ÑŽÐ´Ð¸, Ð·Ð°Ð³Ñ€ÑƒÐ·Ð¸Ð² crack, Ð½Ð°Ñ‡Ð¸Ð½Ð°ÑŽÑ‚ ÐµÐ³Ð¾ Ð²Ñ‹ÐºÐ»Ð°Ð´Ñ‹Ð²Ð°Ñ‚ÑŒ Ð½Ð° ÑÐ²Ð¾Ð¸Ñ… ÑÐ°Ð¹Ñ‚Ð°Ñ…. Ð¯ Ð´ÑƒÐ¼Ð°ÑŽ Ñ‡Ñ‚Ð¾ Ð½ÑƒÐ¶Ð½Ð¾ ÑƒÐ»ÑƒÑ‡ÑˆÐ°Ñ‚ÑŒ Ð·Ð°Ñ‰Ð¸Ñ‚Ñƒ Game maker. ÐŸÑ€Ð¾Ð¸Ð·Ð²Ð¾Ð´Ð¸Ñ‚ÑŒ Ñ‡Ð°ÑÑ‚ÑƒÑŽ Ð¿Ñ€Ð¾Ð²ÐµÑ€ÐºÑƒ “key” Ñ‡ÐµÑ€ÐµÐ· Ð¸Ð½Ñ‚ÐµÑ€Ð½ÐµÑ‚. ÐÐ¾ Ð² Ñ‚Ð°ÐºÐ¾Ð¼ ÑÐ»ÑƒÑ‡Ð°Ðµ Ð½ÐµÐºÐ¾Ñ‚Ð¾Ñ€Ñ‹Ðµ Ð¿Ð¾Ð»ÑŒÐ·Ð¾Ð²Ð°Ñ‚ÐµÐ»Ð¸ Ð½Ðµ ÑÐ¼Ð¾Ð³ÑƒÑ‚ Ð²Ð¾ÑÐ¿Ð¾Ð»ÑŒÐ·Ð¾Ð²Ð°Ñ‚ÑŒÑÑ Game maker. Ð¥Ð¾Ñ‚Ñ ÑÐµÐ¹Ñ‡Ð°Ñ Ð¼Ð°Ð»Ð¾ Ð»ÑŽÐ´ÐµÐ¹ Ñƒ ÐºÐ¾Ñ‚Ð¾Ñ€Ñ‹Ñ… Ð½Ðµ Ð¿Ð¾Ð´ÐºÐ»ÑŽÑ‡ÐµÐ½ Ð´Ð¾Ð¼Ð° Ð¸Ð½Ñ‚ÐµÑ€Ð½ÐµÑ‚. Cracks will always be available on the Internet. To avoid this we need a large number of people to track down offenders. Many people download the crack and begin to spread it on their sites. I think you need to improve the protection of Game Maker. Produce part of the verification “key” via the Internet. But in this case, some users can not use Game maker. Although there are few people now who are not connected to the Internet at home. nobody whats to pay for a program that doesn’t work right. does support.service@hotmail.com ring a bell? it was added to my msg after i started your program. Thanks for putting this up Phil! I am a moderator at yoyogames. If you see any topics, about how to obtain a Game Maker 8 crack, report them by PMing one of us moderators at YYG. I think it’s pretty sh*tty of him to compare himself to Nelson Mandela, regardless of the point he was trying to make. It’s not funny to make light of stuff like that in any way. So far I’ve seen 12 youtube videos which included download links in their descriptions. Unfortunately I couldn’t report any of them because I don’t own game maker. Phil, at some point you should release how many views this blog entry got compared to others. I’d like to see how effective the term “Game Maker 8 Crack” is at accidentally bringing in avid Googlers. I used the calculator and came up with a different number. But close enough. Seriously, I could be a lawyer. Writing to RapidShare, MediaFire, MegaUpload.. know how long they all take to respond, what to include in each, stringent requirements of DMCA. I even have n00bs who think they are “doing their job” by sending me links to pirated copies. You can get any file removed off the internet with a bit of e-mail address googling, whois and good ol’ snooping. Sadly – Game Maker was pirated for so long, the damage may be impossible to undo. (they ALWAYS pirate and keep the OLD, OUTDATED versions don’t they). So people go get GM 6.1 PRO then complain “it don’t work LOL”. See this happens for me with DSGM. Why don’t they just buy it. Srsly. He posted a article about the GM7 Crack (or some crack) and he has already said it brang in many googlers.